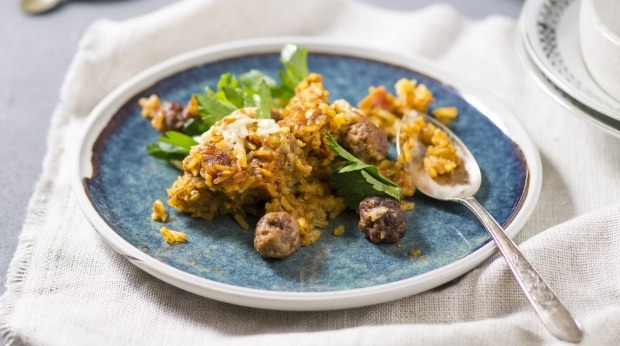 This dish is based on the classic Maltese dish, ross il-forn. Recipes vary, but the principle of gently spiced rice, mince, egg and tomato baked with a layer of cheese on top is the same. This can be made ahead of time and baked when ready – it may just require a little longer in the oven if cold. You can also bake the rice in small dishes for more elegant individual portions, or for when eating together just isn't in the schedule. Serve with a leafy salad dressed with a simple lemony dressing. 1. Add a handful of frozen peas to make this more of a complete meal. 2. To simplify this dish even further, fry off the mince after cooking the onions, rather than rolling into meatballs. 3. Wilt some shredded kale in the pan and omit the mince for a vegetarian version. 1. Preheat the oven to 170C fan-forced or 190C conventional. Boil the kettle and lightly oil a baking tray. 2. Add the rice, saffron and 650 millilitres of boiling water to a medium saucepan. Bring back to the boil and immediately turn down the heat. Cook gently for six minutes until the water has been absorbed and the rice is almost tender. Fluff with a fork and set aside. 3. Add the beef and pork mince to a medium bowl, season with salt and pepper and combine. Roll into balls the size of a five-cent coin and place on the prepared tray. Bake for 10 minutes. 4. Heat the oil in a large frying pan. Add the onion and garlic and fry until softened and translucent. Season with salt and pepper and quickly stir through the curry powder and allspice until fragrant. Add the tomatoes, tomato paste and 600 millilitres of water. Crumble in the stock cube, stir and simmer for 10 minutes. 5. Combine the rice and sauce in a large bowl. Adjust the seasoning and stir in the eggs and meatballs until well combined. Tip into an ovenproof dish and sprinkle over the cheese. Cover with baking paper and foil and bake for 20 minutes. Uncover and bake for another 20 minutes until golden.